Do you hear the winds howling? Is that a harvest blood moon rising in the dark night sky? That’s right friends it is THAT time of year. October is always one of my most productive months as blogs go. Mostly because I have more fun and exciting things to post about. This month should be no different. If you are in the mood to learn more about the month, the holiday and its traditions, I suggest you check out some of my other October / Halloween posts. Today I want to continue something I started last year by posting some great info about a Halloween familiar we are all, well, familiar with. What makes us see the owl as a creature associated with darkness and superstitions? Tufts of feathers on the top of an owl’s head gives them the appearance of horned devils and their piercing cries add to the spook effect found in the ancient folklore of many countries. The fact that they can turn their head around almost 360 degrees is also quite a frightening sight. 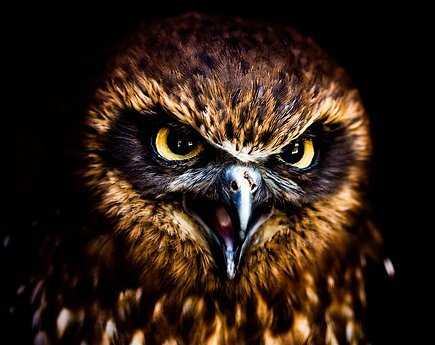 They are meat eaters that are almost alway nocturnal, having wide piercing eyes specially built to see prey in the dark of night. They are found on ALL land masses and like to frequent old, often abandoned structures. It’s no wonder they have such a connection to the mysterious and supernatural beliefs of mankind. Lets explore some of the more common owl lore. In many cultures owls were symbols of magic. In today’s world, we have learned that most of these owl superstitions are just stories, born in a time when people were fearful and trying to find answers to their lives and environment. However, many of these legends survived over time. Here are some other interesting and somewhat strange superstitions that are linked to owls. In England, it was believed that if you cooked an owl’s eggs until they were ash, it could be used as a potion to improve eyesight. In India, if you ate an owl’s eyes you would get the same result. Owls are thought to be the only creatures that can live with ghosts, so if an owl is found nesting in an abandoned house, the place must be haunted. So, what do you think? Do owls give you the willies? Remember Sowain is coming.